During oil and gas production, about 7–10 barrels of polluted water are recovered for each barrel of oil produced. The amount of produced water depends on the geology of the formation and the type of reservoir. With a global oil production rate of 100 million bbl/day, the volumetric production rate of produced water is massive. The cost to dispose of produced water, for example, by deep-well injection, is very high — up to $4/bbl. Improper discharge of these streams can damage the environment, destroy local ecosystems, and pollute natural water sources. Treatment of produced water is very challenging, as it often contains large amounts of dissolved salts, scaling compounds, silica, and a variety of organic species. Efficient treatment techniques are critical for developing economically viable oil and gas operations. It is essential to reduce total dissolved solids (TDS) and total/dissolved organic carbon (TOC/DOC) to levels suitable for discharge or external reuse. The Membrane Science, Engineering and Technology (MAST) Center is developing novel membrane-based technologies for treatment of produced water. Direct-contact membrane distillation (DCMD) is one of the most promising strategies. In a DCMD process, the hot produced water supplies the driving temperature difference for water vapor to pass through very fine pores of hydrophobic membranes, which do not allow penetration by the brine solution. Water is recovered as cold distillate on the other side of the membrane. ▲ Engineers at the Univ. of Arkansas treated produced water with flat-sheet ECTFE membranes provided by 3M, a MAST Center sponsor. Steam-assisted gravity drainage (SAGD) is an enhanced oil recovery process. MAST researchers at the New Jersey Institute of Technology (NJIT) found that DCMD could be used to treat SAGD produced water, which is at high temperatures (130–160°C) and pressures (2–5 atm). Previously, DCMD had not been carried out under such high temperature and pressure conditions. In particular, hydrophobic flat-sheet as well as hollow-fiber membranes of polytetrafluoroethylene (PTFE) and polyvinylidene fluoride (PVDF) were highly effective at recovering water and rejecting TDS. The water recovered after membrane treatment could be used directly as a boiler feed to produce the steam needed for injection into the oil shales. The results obtained from this research are under consideration for potential licensing. In MAST studies at the Univ. of Arkansas (UA), engineers used flat-sheet ethylene chlorotrifluoroethylene (ECTFE) membranes to treat produced water obtained from natural gas extraction facilities in the Marcellus and Fayetteville shale formations. Before treatment, the produced water contained 22,000–235,000 mg/L TDS. Water recoveries up to 70% were achieved during testing. And, in a continuous long-term trial, a brine sample containing 134,000 mg/L TDS was concentrated up to 50% using DCMD for over 434 hr at a constant rate of treated water production. These results indicate that the commercial ECTFE membrane is ideally suited for treating produced waters. A team from the Univ. of Colorado Boulder, on behalf of MAST, developed a bicontinuous cubic lyotropic liquid crystal (LLC) nanofiltration membrane (dubbed TFC QI) that can treat highly contaminated produced waters. The monomer and polar solvent of the LLC arrange themselves (i.e., self-assemble) into a nanostructured material with discrete hydrophilic regions (i.e., pores); this nanostructure is locked into place via polymerization. 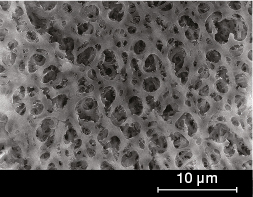 The pores, approximately 1 nm in width, extend continuously throughout the material, creating a network through which water and solutes can pass. This nanostructure distinguishes the TFC QI membrane material from its less-structured commercial counterparts. The membrane has pores comparable in size to those of a commercial nanofiltration (NF) membrane, but a salt rejection capability closer to that of a reverse osmosis (RO) membrane. When applied to aqueous industrial streams, this novel TFC QI membrane exhibits a unique ability to collect small organic solutes from high-salinity, oily feedwater and produce a lower-saline permeate stream. A feed stream containing 15,000 mg/L TDS and 1,250 mg/L DOC was treated with this membrane; the retentate contained only 5,000 mg/L TDS and 210 mg/L DOC. The treated stream was then fed to a biological degradation unit for final treatment. After biotreatment, a total water recovery of 50% was achieved, with a 67% reduction in TDS and a 95% reduction in DOC. This research was funded through the National Science Foundation’s Industry-University Cooperative Research Centers Program (IUCRC).